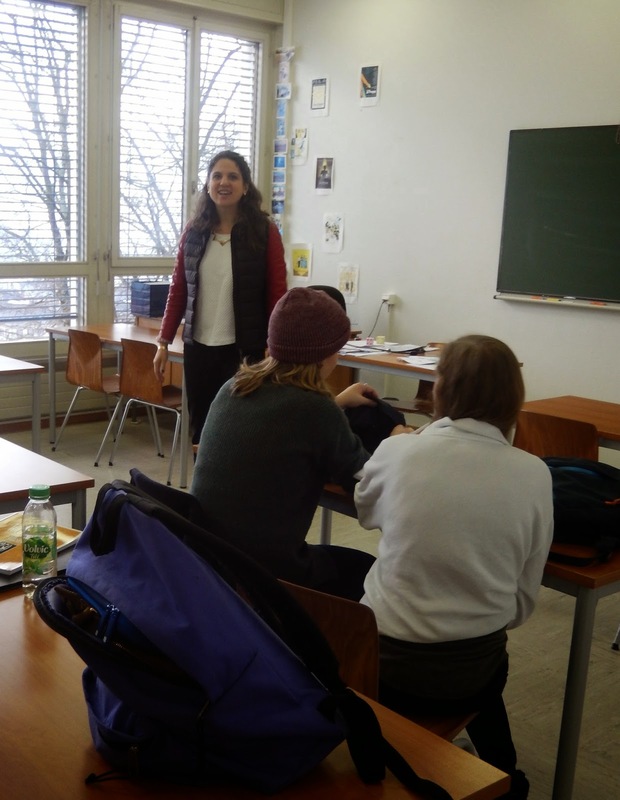 After a two week school break, I am now back in Switzerland and back in the classroom. 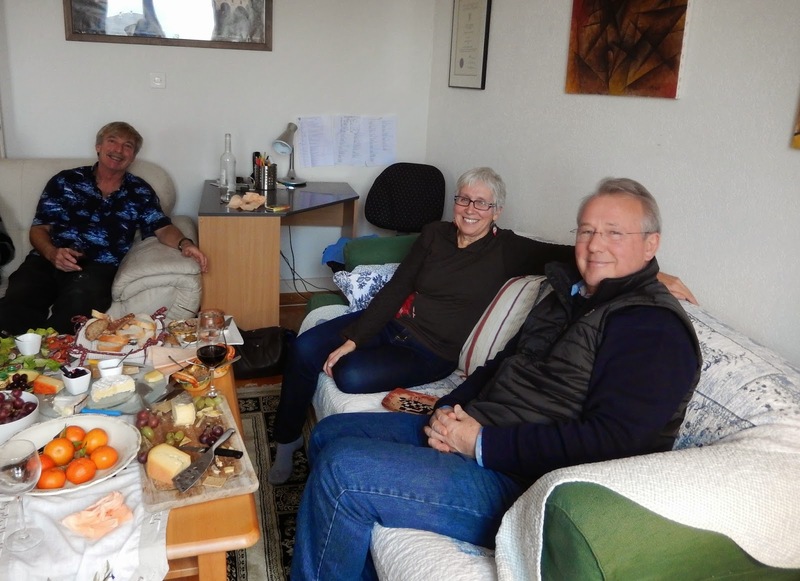 Being away has added perspective to my European experience; it was delightful to be home in Toronto, but I was quite content to return to Neuchâtel. After five months here, I have clearly made strong connections with the people I spend most of my time with, my colleagues and my students. It has been good to see them again this week. 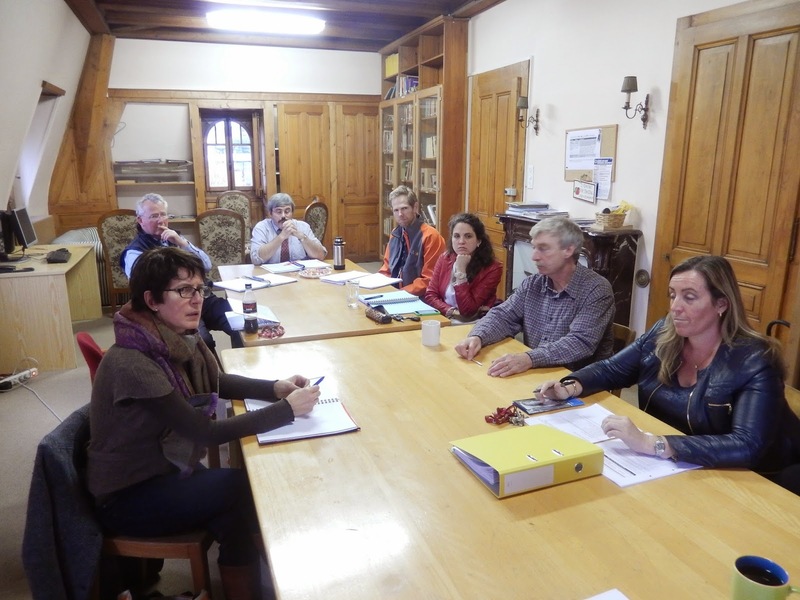 The Pavillon Posse gathered recently for a staff meeting. (I am behind the camera.) Don't we look excited?! Every school day, I arrive at the Pavillon building before 8:00. The students take all their courses in the seven classrooms that make up the Pavillon. I have never been the ONLY English teacher on a staff - not by a long shot - and this isolation in my teaching practice felt daunting at first but I soon realized that my colleagues are all in the same boat. 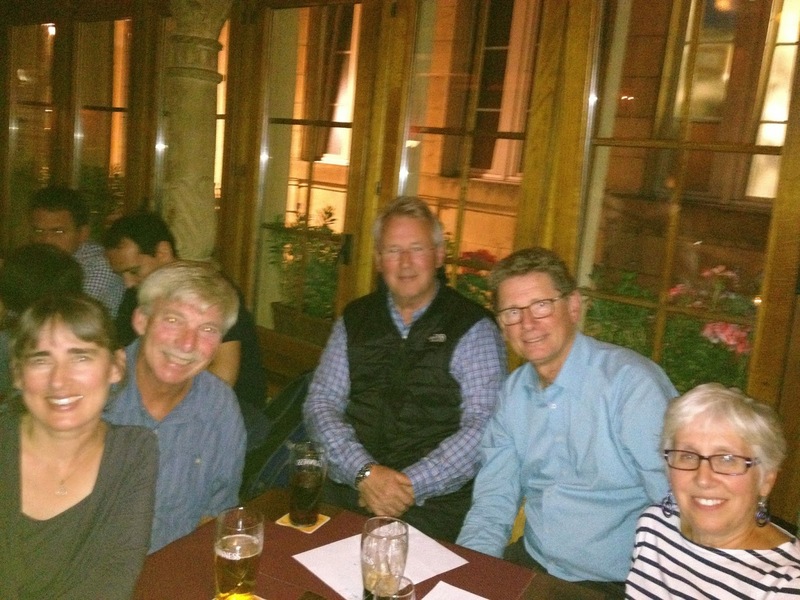 In fact, five of the eight teachers at Neuchâtel this year are new to the school, a circumstance that has further added to our team bonding. We are each others' support system. 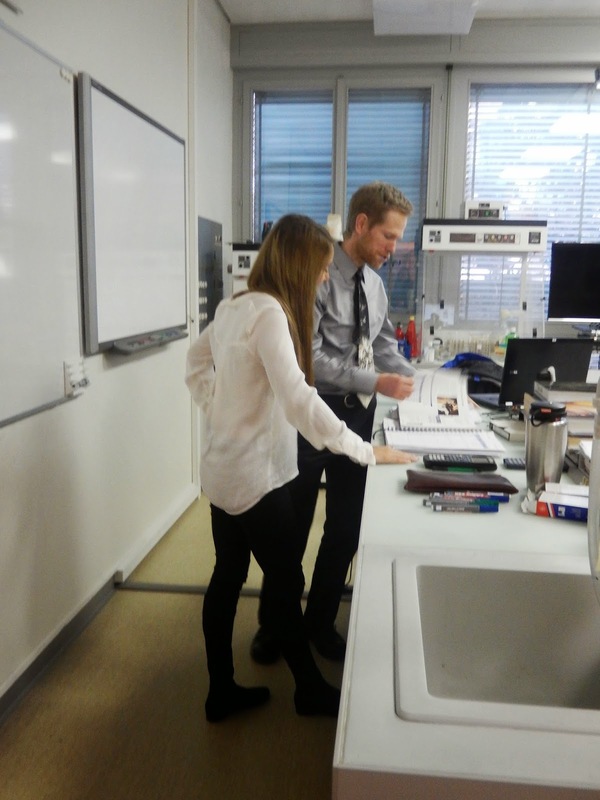 Aaron Bellamy is the science guy, the man in the white coat; this year he is responsible for three courses: physics, chemistry and data management. While he comes across as soft spoken and very polite, he is quite adept at throwing an occasional "bon mot" to lighten up some of our discussions. Any time I complain that the weather is turning cold, Aaron reminds me that "cold" is a relative concept, since last year, he worked in Nunavut. 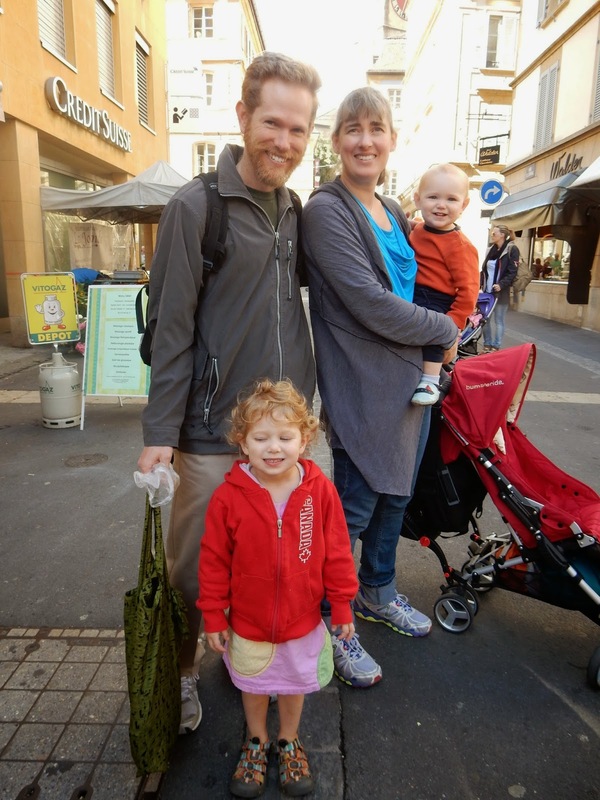 Unlike the rest of the Neuchâtel rookies, Aaron has arrived in Switzerland with his family in tow. He and Beth are parents to three-year-old Rae and one-year old Isaac, two delightful children who have become big favourites among the students who occasionally babysit for the Bellamys. In fact, we all enjoy having his children among us. Aaron and Beth have opened up their home to all of us a couple of times for birthday parties. Soon we will gather there again for a Robbie Burns night. Sarah and I bonded early with our (somewhat) matching shirts. Sarah Bergeron-Laliberté is a Quebecoise now living in Bern and married to a Swiss. 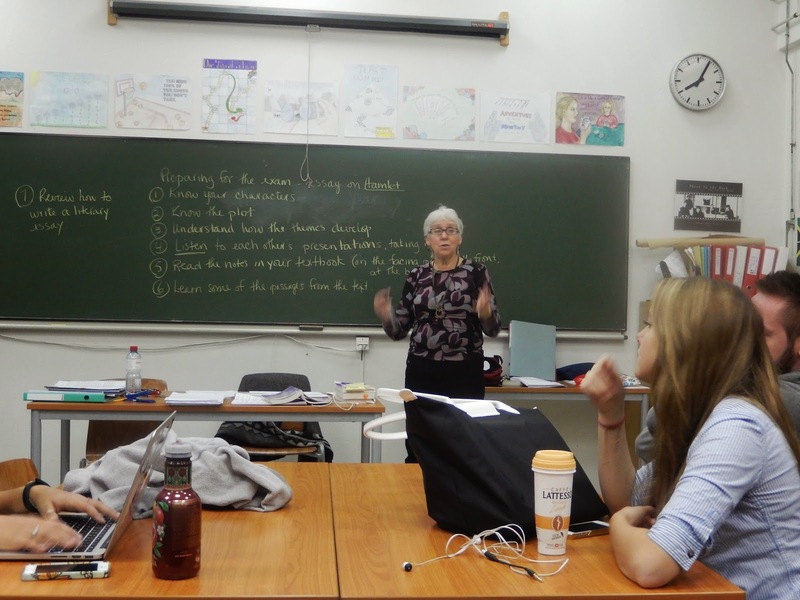 Her teaching role in the school is unique in that she is responsible for both the 12U French course as well as a number of conversational classes which are not for credit but are geared towards getting the special school diploma. One of the goals of the school is to make a French speaker out of every student and Sarah is an important part of this. 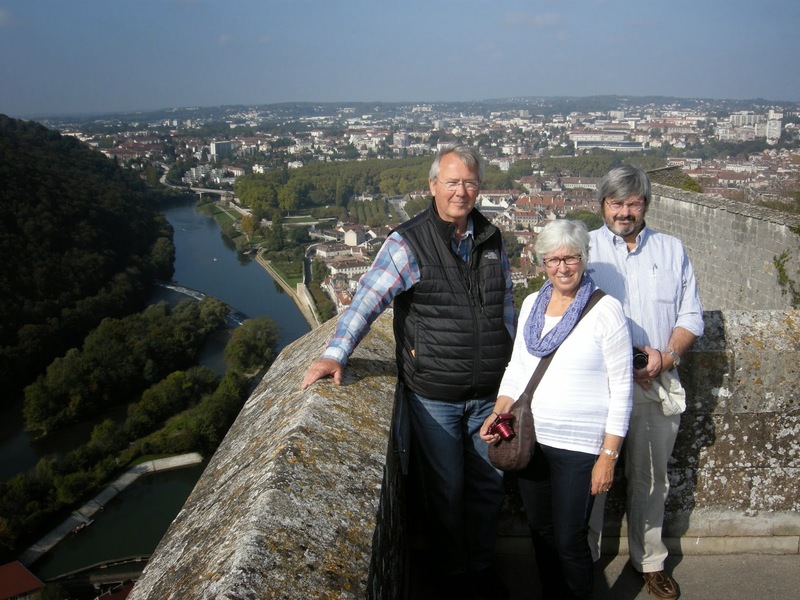 Like Aaron, Sarah has a young family, two girls aged three and five, Emma and Léonie, but since she lives far away, we have only met them once, at the Désalpes in Lignières. She has been at NJC for the past six years, at least when she has not been on maternity leave, but she is here only part of the time. I enjoy my "Franglais" conversations with Sarah, where she speaks to me in French and I respond in English. On occasion, she willingly aids me in practicing my French. Paul Duckett is a math specialist who works diligently with his classes to increase their number sense. Like me, Paul has come out of retirement to experience life in Switzerland. Also, like Terry and me, he is here without his spouse for much of the time. We all find this a big adjustment and miss them all the time. Nevertheless, Paul has been eager to see as much as possible of the surrounding regions, and so he has often joined Bob (when he was here) and me when we have travelled. 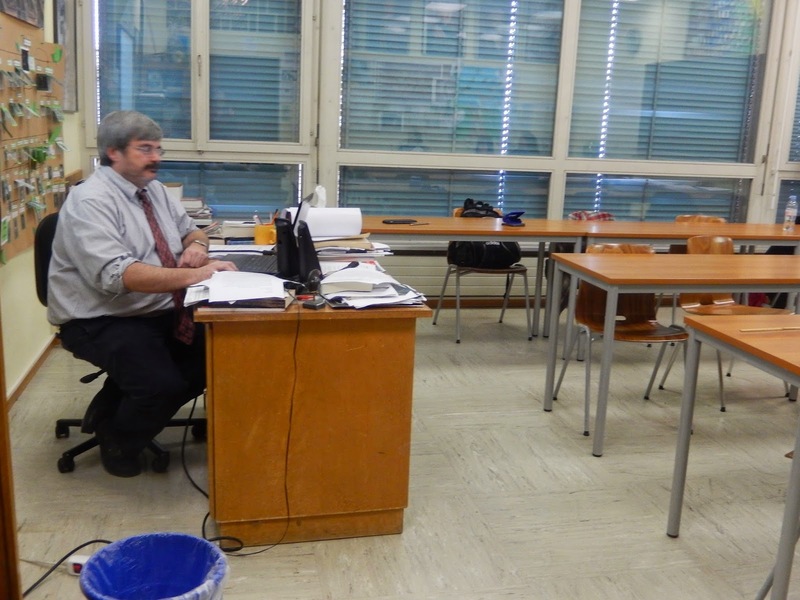 We all take advantage of Dan's generosity, since he is the only one among the full time teachers with a car. At Christmas, Paul and I returned to Canada on the same flight and were able to spend some time in Zurich the day before we left. Upon our return, we met at Le Musée des Beaux Arts here in town to see the automatons in action. Paul will leave us at the end of this semester. He will be happy to go home but we will miss him. 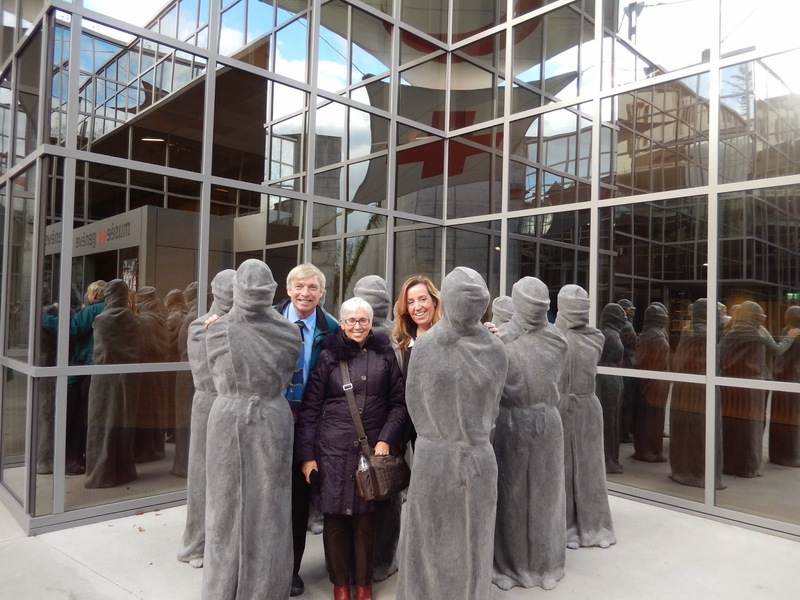 Jen, Terry and I at the Red Cross Museum in Geneva. The door is always open in Jen's office. Jen MacLachlan wears two hats here at the school. 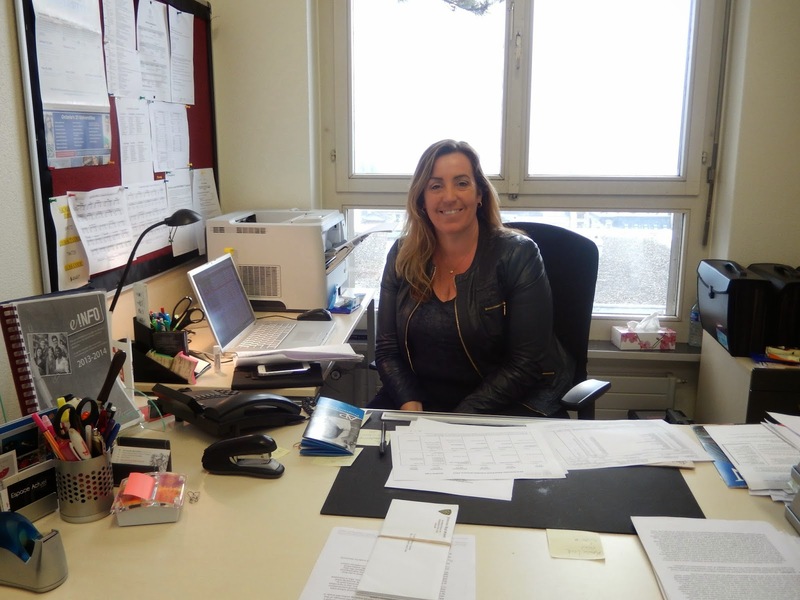 In her roles as Deputy Head of School and guidance counsellor, she does not have daily contact with a group of students (as the rest of us do), but she is always there for them. She has stayed on top of the University application process and has advised them on course selections to get them to where they want to go. She has also supervised SAT examinations, and will arrange for Advanced Placement exams for those who choose to complete them in May. When students have individual problems, Jen listens sympathetically to their concerns and seeks out solutions with them. She is very supportive of her teaching colleagues as well. In the evenings, Jen usually makes time to talk to her son, Jacob, on Skype. Over the Christmas break, he joined her here and then travelled to Kenya on the Free the Children trip. Since Jen and I live in the same building, we often walk to and from school together. She is such a busy woman, I enjoy these opportunities to catch up with her. Where are your students, Dan? Dan Martin is the only non-Swiss resident among the teaching staff who is not new to the faculty. Because of this, he is a very experienced and valued resource for all of the rookies. His current tenure at the school goes back five years, and some twenty years ago, he was here for three. He speaks French fluently, and can get by in German too. With expertise in history, he plays a major role in many of the school trips, since he knows the complex historical facts of each region we visit as a school. As already mentioned, Dan is most generous with his time and with his little Peugeot, in which he has taken some of us to various locations in France and Switzerland on weekends. He is also an epicure, with a love good food and wine. Twice so far, he has arranged delicious social gatherings at his apartment. Frequently, too, he finds a new local restaurant for us to try and then drives us there. We are off to a new one tonight. 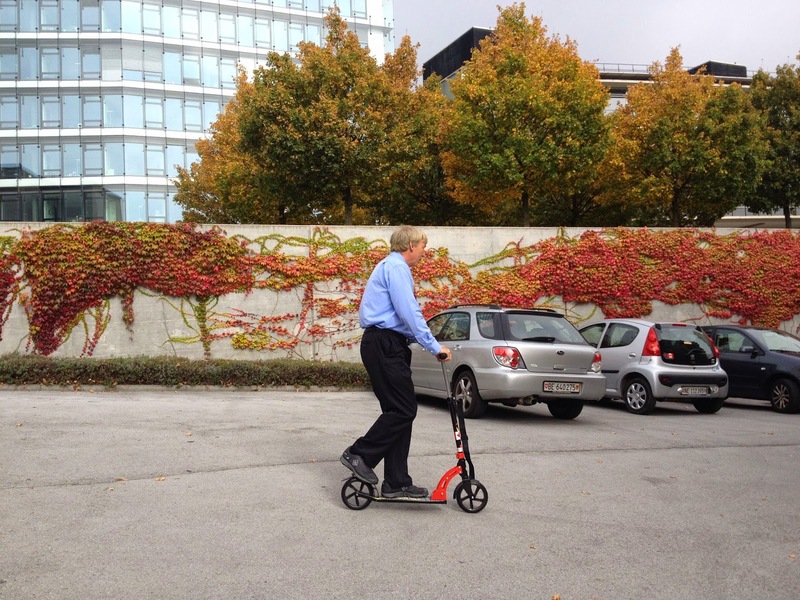 Terry has joined the students in adopting the scooter as a form of transportation. Kienan kneels before his teacher. Terry Reynolds is the jack-of-all-trades among us. By the end of the year, he will have taught six different courses, all of which are rooted in the social science or business areas. He is also the school athletic liaison who travels with the students for competitions with other International Schools in Switzerland. Terry's classes are often punctuated by eruptions of raucous laughter, as he is (in)famous for his relentless puns and great sense of humour. I often apologize to my students for the grimness of the English curriculum (it is hard to make war literature funny) when I hear all the fun Terry's students seem to be having. 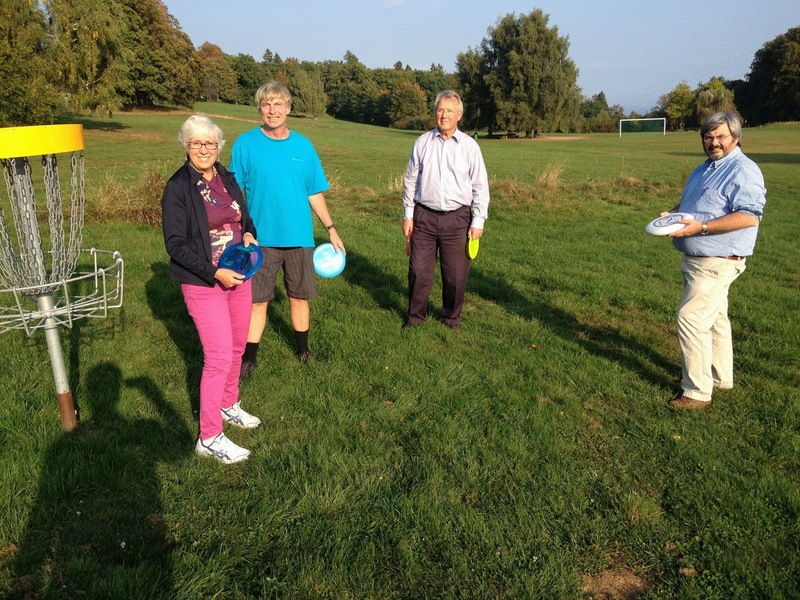 Like Dan, Terry enjoys entertaining and has arranged a number of gatherings for all of us. He also traveled with Dan, Bob and me to Annecy in early September, but has not been on some of the more recent trips because of family and school commitments. 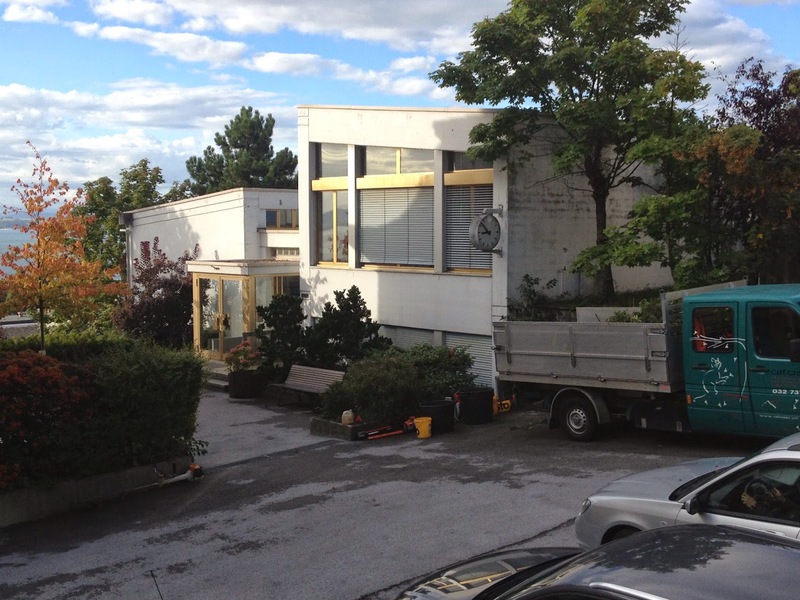 The only Swiss among the instructional staff, Christine Weibel teaches and creates art. Among the teaching staff, she has had the longest tenure at Neuchâtel, eleven years. 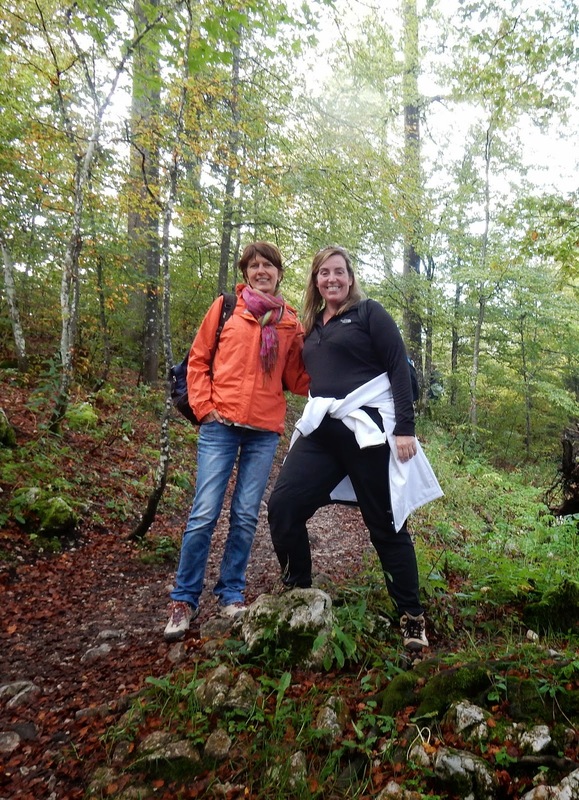 Her true Swiss character came through when she led some 20 students and 5 adults on the hike up the Creux du Van in September. The woman is part mountain goat! Not only was she up to the top quickly, but she walked part way down again in search of stragglers; she also retraced her steps later when we lost contact with a handful of hikers on the descent. In all, she probably covered nearly twice as much distance as the rest of us and still had lots of energy to spare. 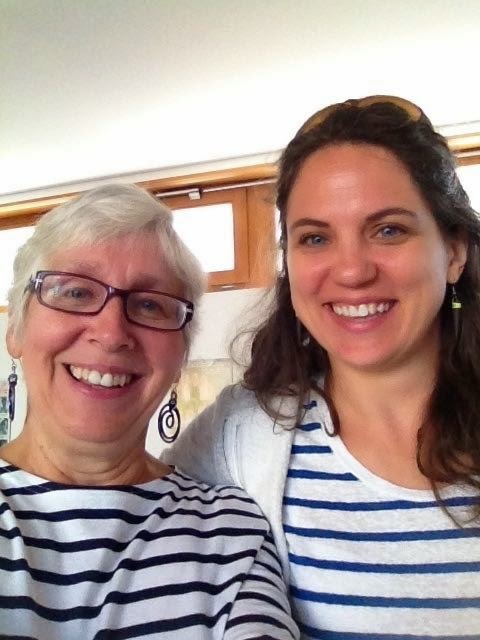 Like Sarah, Christine is a part-timer at NJC; she teaches at another local school as well. Her passion for art is extended into where she has chosen to live - the beautiful village of Vevey near Montreux, about an hour away. 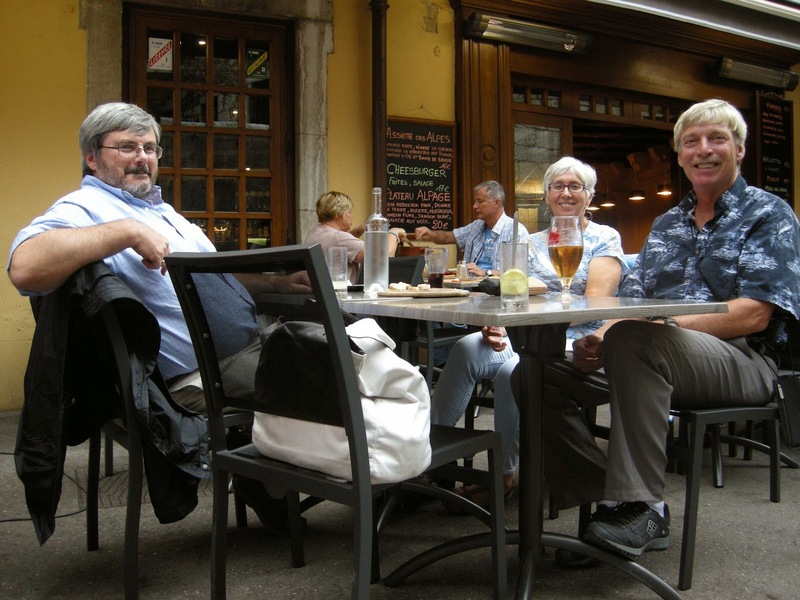 Dan, Terry and me in Annecy. With me, that makes 8 of us who spend our days in the Pavillon. The Canadians often do things together outside of work too, since we know no one else in the town. Every other Tuesday evening, there is a pub trivia competition at a local bar, Le Cerf. We call ourselves "The Canucks" for obvious reasons, and when we are sharp, we place in the top three. In the fall, Terry organized a couple of outings to a park above the town for frisbee golf, a game at which he excels, by the way, due to his superior frisbee. It is good to have people to work with who actually like each other. While I miss my friends at home, I know I have a strong core of good people here to keep me going. Next week, I will write about the rest of the staff - the Foyer Folks. Stay tuned. Very nice to hear about your teaching friends. A varied and interesting group!